A huge collection of heartwarming, brain-puzzling, and character-driven traditional mysteries that'll keep you entertained for hours. (At 213,000 words, this is 627 pages of reading material!) Plus, you can email to get a FREE Bonus File with recipes and holiday craft ideas. Celebrate the holidays with stories by these thirteen bestselling and award-winning authors: Joanna Campbell Slan, Neil Plakcy, Lois Winston, Annie Adams, Jenna Bennett, Nancy Jill Thames, Sara Rosett, Camille Minichino, Nancy Warren, Linda Gordon Hengerer, Joyce and Jim Lavene, and Teresa Trent. 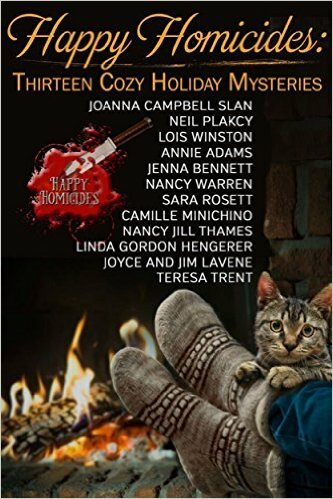 This is a collection of Cozy Holiday Homicides just in time for the Holiday Season. First, I must admit that when I asked to read and review this book, I was not familiar with any of the authors. I love cozy mysteries, though and couldn’t resist wanting to read this collection of thirteen stories all in one huge compilation of 669 pages. Some of the stories have murder in them. Some do not. All the stories are well written, well-paced mysteries that are character driven and they are “cozy” mysteries. There are stories with animals in them and some without. Some of the stories I enjoyed more than others, but overall I liked them all. I really enjoyed this set and can recommend it to others without any difficulty, especially now around the holiday season. I wish there was a paperback version available in order that I could purchase it and keep it in my home library and read when I felt like reading a cozy mystery short story. There’s a variety of stories here, enough for someone to love. My personal favorites were Dog Forbid, Teddy Saves Christmas, and The Dog Who came For Christmas. Yes, these have animals starring in them. Disclaimer: I received a copy of the e-Pub from Reading Alley in exchange for a fair and honest review. Until next review, stay safe. Smile! Show compassion to others. Be nice to one another. Be a voice for the voiceless! Read a book and pass it on. Review it. Reviews are very important tool for authors. Cheers!